They relate to a wooden gazebo built outside the premises. 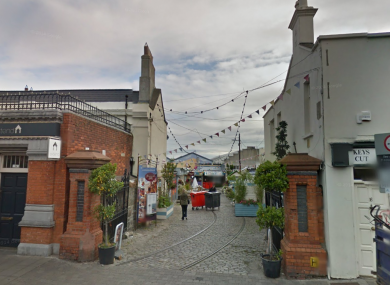 THE TRAMYARD CAFÉ Bar Restaurant in Dalkey Village has been closed down by order of the High Court until it complies with fire safety regulations. Bank appointed receiver Ken Fennell, of Deloitte, today was granted a temporary High Court injunction directing David Coulson, operator of the café bar and restaurant, to pull down the shutters. Coulson now has to comply with an enforcement order issued by Dun Laoghaire Rathdown (DLR) County Council earlier this month directing that the premises close on grounds of fire safety. It led to cancellation of the Dalkey Lobster Festival. Barrister Stephen B Byrne, counsel for the receiver, told Mr Justice tony O’Connor that the closure was primarily being brought because of “serious concerns” about public safety as well as preserving the value of the building. Mr Byrne said Mr Fennell had only days ago become aware of the fire safety concerns and the issuing of the enforcement notice on 18 August last. He said the fire safety concerns, first reported to DLR County Council by a senior garda, related to a wooden gazebo built outside the premises. Mr Byrne said that despite the local authority’s decision to issue an enforcement notice ordering the closure until safe safety regulations had been complied with, the restaurant café continued to trade. He said the planned Lobster Festival had been cancelled after Mr Cloulson had been informed in writing of the County Council’s concerns. Mr Byrne told the court that failure to comply with an enforcement order amounted to a criminal offence and Mr Fennell had no option other than to bring High Court proceedings. The court heard Coulson operates the Tramyard on a purported lease. The premises, currently up for sale, is owned by another party and had been put up as security for loans provided by Ulster Bank. Mr Fennell had been appointed Receiver last year by financial fund Promontoria (Ltd) which had acquired the loans from Ulster Bank. Judge O’Connor, granting the injunction on an ex-parte basis, he particularly noted the evidence in relation to fire safety concerns. The Judge adjourned the matter to next week. Email “Dalkey café bar temporarily closed by judge over fire safety concerns”. Feedback on “Dalkey café bar temporarily closed by judge over fire safety concerns”.